Submissions: Articles, announcements, etc., should be setup on your own website and the website address of the article sent to editor Brian Pankuch at pankuch@eclipse.net or pankuch@hawk.ucc.edu for review and acceptance. Authors are requested to keep material available for at least a year after publication, longer would be preferred since the Newsletter will be searchable from the Internet. We anticipate increased communication between authors and readers and plan to make these discussions available to all subscribers. A listserv will be provided and managed for these discussions. Suggestions are welcome! Submission deadlines: Fall issue -Sept. 25; Spring issue- March 15. ALL NEW AND RENEWAL SUBSCRIPTIONS: To be notified when new issues are available subscribe at: http://www.science.lcc.whecn.edu/CCEN/ You will be emailed when new editions are available. Send meeting notices, etc., to Don , ROSEN@CLVM.CLARKSON.EDU. HOERR@ eagles. Icc. whecn .EDU. During a recent review session, I asked one of my students to go to the board and demonstrate a general chemistry problem that she said she couldn't work. She did have some difficulty, but finally was able to work through to the answer successfully with only a little help. As she sat down, I said, "Now, that wasn't too bad, was it?" With a smile, she replied, "Actually, it was kinda fun." Aside from any chemistry that she learned, I hope that she recognized that facing a challenge can be fun, especially if you can count on support to help you through the tough spots. I was reminded of this student as I prepared to write my message as outgoing chair of the CCCE Committee. It has, indeed, been a challenge, but it could have been much harder without the assistance that so many of you have provided. Most important of all, as my student learned, it is fun to meet a challenge when you have the right support. I believe that higher education has set out on a voyage of discovery into new, unexplored terrain, and this committee is serving as pathfinders for one part of that exploration. It has been exciting (and perhaps a little frightening) to be a part of this process. If you think back to a decade ago, it is amazing to remember how many developments that we now take for granted weren't even visible on the horizon. Higher education, long renowned for its resistance to change, has probably moved more rapidly in that past decade than it has in the previous fifty years. And the pace of change still seems to be accelerating! lt is hard to imagine where we may be in another decade. The job of this committee is to stay ahead of these developments. It will probably continue to be both exciting and a little frightening. As my student discovered, despite all the stress, it can be fun as long as we work together to support each other. Thanks to all of you who have helped me through the past two years, and I hope that you will continue to enjoy the trip. This is our last printed version of the Newsletter. We are going to put our future editions on the Web. You can see a draft version (http://www.ecIipse.net/~pankuch/Pages/NewsletterCCE.html) and subscribe (http://www.science.lcc.whecn.edu/CCEN/) to be notified when new editions are available. Your subscription will be handled by this listserv. We would also like to experiment using a listserv to provide a convenient method of allowing you to query authors and share the question and response with everyone on the listserv. My own vision comes partially from work as an outside contractor about six years ago at Sandia National Labs where I set up my first website. Sandia was in the process of getting people to save everything online with no paper backups. They were trying to do everything electronically. I've experimented and found myself moving in that direction, with notable exceptions like this Newsletter. I havent had a printer connected to my main system for years, and it changes how I work. For instance I was reading an interesting review article on the web, and it had well over a hundred references. Many of them were linked to the abstracts or complete papers. I got a lot more out of the review by being able to click and read much of the supporting material. Recently I was giving a PowerPoint lecture on using PowerPoint in our professional development series at my College. Before the presentation I had a request for hardcopy from the head of Interpreters for the Deaf program. As I sent it out I was struck by how much would be missing since a good part of the presentation was use of color, animated text, sound, links to video clips, animations, simulations, computer programs, QuickTime movies, panoramas, etc. All were presented by working examples, a lot was lost in translation to text. I understand and agree that hardcopy has many advantages. At the moment my vision for the Newsletter is what you see in the draft. A page of contents with links to the authors' sites. All the text material should be printable from the authors' site. This requires authors to put up their own material at their own site or to work with one of our editors to put the material up at the editors site (http://www .eclipse. netl-pankuch/Pages/Submissions.html). Suggestions have been made that the Newsletter be available as one file that would be readable and printable from one site. This is a fine idea and is just waiting for someone to volunteer to put the material available at the Newsletter site together at their own site. We are completely open to new ideas and volunteers to make them work. This is your Newsletter and should reflect your interests. Kotz 's articles (http://www.eclipse. net/-pankuch/Pages/NewsletterCCE.html} on using and developing PowerPoint lectures in general Chemistry. Not only does Jack explain what he is doing he provides links (http://www.oneonta.edu/-kotzjc/LecShell.html) to actual PowerPoint material (http://www.oneonta.edu/-kotzjc/PowerPoint.html) he is using. It can be quite exciting. As an experimenter in some new techmques I find it far easier to get them working on my own site and have students use them on my site. If we are receptive to experimenting with new modes and methods we may develop some new exciting lines of communication and learning. I'd like to encourage new ideas and suggest that working examples of what you are doing are much easier to understand than just a written description. Perhaps we can also provide links to How To sites on topics of interest such as using computers in lab, video clips, animations, simulations, computer programs, QuickTime movies, panoramas, PowerPoint, etc. For example Yale Style Manual-Table of Contents: (http://info.med.yale.edu/caim/manuall} is quite helpfulm designing web pages. 0n January 1, 2000 I became Chair of the Committee on Computers in Chemical Education (CCCE) succeeding Harry Pence, SUNY Distinguished Teaching Professor, State University of New York at Oneonta. Harry has been a member of the CCCE since 1987 and served as Chair for two years. For many years he wrote book reviews and served as book review editor for this publication. He has organized symposia at many of the ACS National Meetings and BCCE meetings and presently serves as a member of the Division of Chemical Education's Program Committee. He was Co-Chair of the Division's program at the National Meeting in New Orleans in the Fall of 1999, continues as a member of the CCCE and has agreed to help organize and coordinate computers in chemical education symposia at national ACS meetings. On behalf ofthe Committee and myself, I would like to thank Harry for his many contributions. The Committee on Computers in Chemical Education (C.C.C.E.) seeks to encourage and support the development, implementation and assessment of computing technologies in chemical education. We solicit your assistance in these endeavors. Your ideas and suggestions are always welcome. The Committee currently consists of twenty-two members. Their names, addresses and computer interests may be found on the Committee website (http://www.ched-ccce.org/index.html/). This Newsletter has been published in its present format for about twenty-two years. We have decided to discontinue publication of a printed copy and instead make it available on the Committee's website (http://www.chedccce.org/newsletter.html/). Initially, publication will occur twice each year, as at present. On-line discussion of the Newsletter and Newsletter topics will be a feature of the new format. 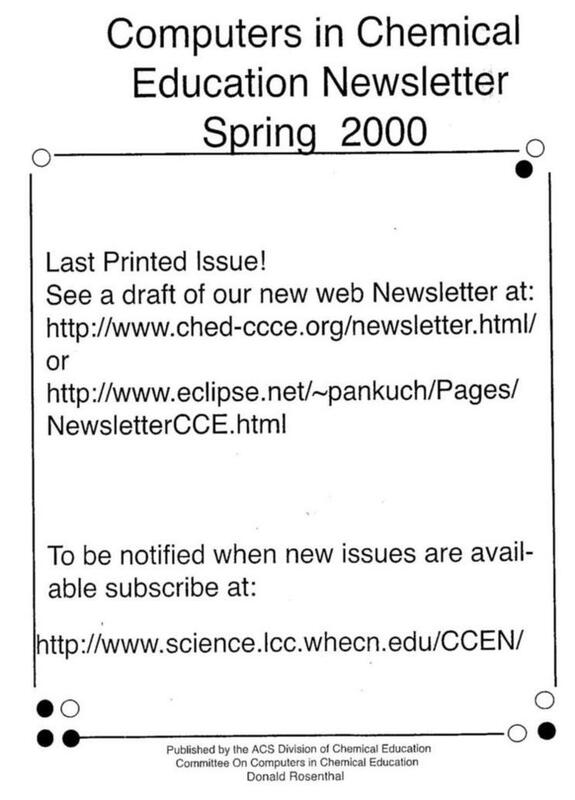 The on-line version of the Newsletter will be available in October 2000. Harry Pence is coordinating the organization of computer symposia by the CCCE. If you would like to organize a symposium or have suggestions for future symposia, please contact Harry (pencehe@oneonta.edu). The Washington ACS Meeting this fall includes a CCCE sponsored symposium entitled "What's the Next Big Step in Using Computers to Teach Chemistry?" A schedule of on-line conferences is available on the CONFCHEM website (http://www.ched-ccce.org/confchem/). These conferences generally have between 600 and 800 registrants. If you have suggestions for future topics or are interested in organizing an on-line conference, please contact Brian Tissue (tissue@v1.edu) or me (rosen@clvm.clarkson.edu). If you would like to present a paper at an already scheduled conference, contact the conference organizer. National Computer Workshops have generally been held the weekend before BCCE meetings. Four or five workshops run concurrently. No workshop has been scheduled for the BCCE at the University of Michigan. We expect to offer workshops for the 2002 BCCE. If you have workshop suggestions, please contact me (rosen@clvm.clarkson.edu). The CCCE has sponsored four on-line courses since the spring of 1996. Sylvia Esjornson served as chair of the organizing committee for the Spring 2000 course on Environmental and Industrial Chemistry. Consult http://www.ched-ccce.org/olcc/index.html/ for more information on OLCC courses. A CCCE subcommittee continues to maintain the Divisian of Chemical Education website at: http://divched.chem.wisc.edu/divched/. The Committee on Computers in Chemical Education will hold an open meeting at 12:30 PM on Monday, July 31, 2000 in Chemistry Room 1200 at the University of Michigan BCCE. Have an early lunch and join us. Many members of the Committee will be there. We welcome your comments and suggestions. Additional information can be found at the BCCE Website (http://www.umich.edu/~bcce/meetings.htmll). The success of the Committee depends upon our interaction with you and other chemical educators. Please send us your ideas and suggestions. Your articles submitted to this Newsletter are published in a timely manner. I hope to see some of you at our open meeting at the BCCE.